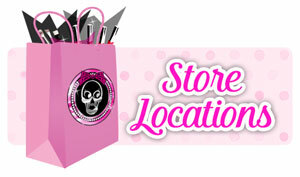 Skull Sugar Cosmetics® are for the fun and fashion forward consumer! We offer a wide range of high performance pigments for the makeup artist, fashionista or makeup diva! Our formulas consist of all-natural powders, which are made of 100% pure minerals. Skull Sugar Cosmetics® offers you a complete line of natural, cruelty-free and hypo-allergenic makeup free of parabens, talc and other artificial fillers. Everything from our eye shadows to our mineral foundations are made using high-quality ingredients and meant to create a vast array of looks from natural beauty to edgy fashion! The superior quality and highly pigmented makeup ranging from eye shadows, primer and liners to our deluxe foundations makes Skull Sugar Cosmetics® the premier choice for exceptional mineral cosmetics. An exclusive milling process creates luxurious formulations that are easy to apply and look brilliant on your skin. We are proudly based in Portland, Oregon, and are thrilled to ship our products to customers worldwide. Skull Sugar Cosmetics® were created in December 2012 by expert makeup artist Jamie O’Neill. She created Skull Sugar out of the need for highly pigmented and versatile shadows that still held up with her high standards. additives, making it suitable for all skin types including the most sensitive skin. The natural ingredients work with the oils in your skin to provide you with a flawless coverage. Skull Sugar Cosmetics® is proudly cruelty free! Foundations, Eyeliner, Blush, Bronzer, Eye Pigments, Lipgloss, Brow Powders, Eye Primer, Mineral Veil & more! * October 2013 & 2014: Skull Sugar Cosmetics named the official cosmetics line used backstage at Fashionxt for designers such as Seth Aaron, Michael Costello, Michelle Lisniak and Francis Liberian. Get the latest promos and news straight to your inbox!